I decided to go down to see my mate Tim in Hastings as he had his own place down there. He would constantly tell me that Havelock North had such a great nightlife. We ended up going out on Thursday, recovered watching the footy on Friday. Come Saturday we were hyping it up far too much, bragging that it was time to go out with one last bang. That’s until Tim suggested that it would be a good idea to try magic mushrooms that his dad that picked that morning. Tim’s dad was the most awesome guy, if you could imagine Gandalf from Lord of the Rings, mix him with Willy Nelson and you have Tim’s dad. We put the mushrooms in the blender with water and coffee; it tasted like dirty old socks with chunks of skin mixed in it. 30 minutes went by and nothing had happened so I ordered the taxi, had a couple more swigs of the disgusting drink and away we went. Just as we got to town my face started to feel weird and as if it had been numbed with local anaesthetic. As we entered the first club the whole room seemed a lot brighter than normal but I had no feelings of nausea like Tim’s dad suggested I might. I felt as if I was somewhat in a cartoon, kind of hard to explain. The room seemed to be oblong in shape and finally the distortion hit. The walls seemed to reach out to me and the room seemed to be shrinking, I simply followed my one rule which was to enjoy the trip. I looked at Tim and could see he was tripping out, constantly licking his lips and at the time I thought he was a type of lizard man. I keep telling myself to remember that it is all in my head and that it will go away. The colours kept getting more intense and they soon had a sort of aura around them, like a rainbow surrounded each and every object I held. Tim suggested going for a walk and feeling adventurous because of the current state of mind we were in, I agreed to tag along. There I was tripping out and marvelling at all the colours and scenery around me. We walked all the way back to Hastings from Havelock, just buzzing out. Cars looked like magic flying beams of light and clubbing was just an afterthought. We got home at 6am and I was in deep thought about nothing. Physically exhausted but my mind racing, I laid down but couldn’t sleep and my brain felt like it was going to explode. 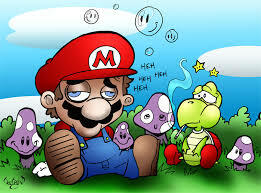 That was the last time I do mushrooms, the magic ones!